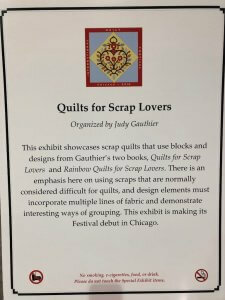 The exhibit at the International Quilt Festival in Chicago was very well received. We had 13 quilts in total at the festival. The quilts were made by various quilters from around the country. The challenge was to make a quilt using a pattern from my first book, or my second book, or both combined. It was also acceptable to use the 3 1/2, 4 1/2 and 5 1/2 inch templates for any part of the quilt or to make a new block using those templates. The quilts were absolutely beautiful. There were so many woman and men that shared their appreciation for the scrap quilt exhibit. I walked through the exhibit with the viewers, and explained to them the special features there were in the quilts, and the qualities that were being showcased. 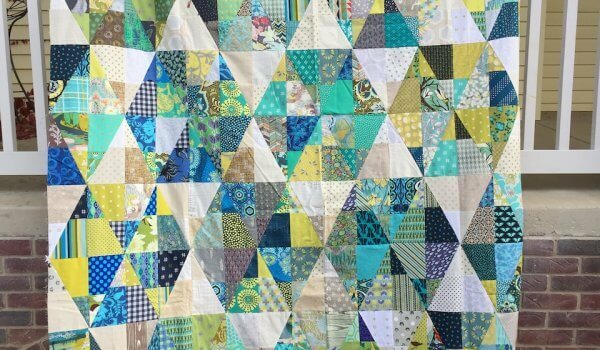 There are qualities that make a good scrap quilt, and qualities that make a great scrap quilt. Now I may not be the foremost authority, but I do think that over 40 years of sewing with scraps gives me a little bit of a say. Some of the things that I think that make a great scrap quilt are as follows. 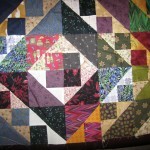 Use of actual Scraps-A scrap quilt really should be just that. Made from scraps. 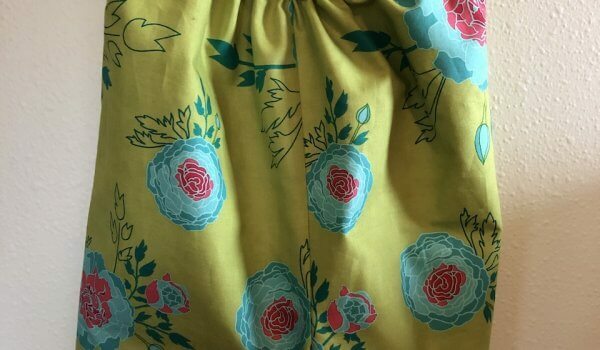 This doesn’t mean that the scraps cannot be enhanced by use of other fabrics in one’s stash. Sometimes you need a filler for the backgrounds. Sometimes you need more of a particular color. 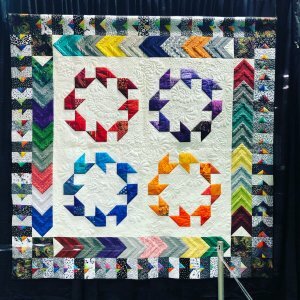 It’s okay to fortify your scraps with a few new pieces, but a scrap quilt should never, ever have a grouping of fabric from one “line” of fabric. This creates a contrived appearance. Use of improvisation-When I talk about improvisation, I don’t mean it in the sense of modern improvisational quilts. Modern improvisational quilts are a type of quilt in and of themselves, and are in a group onto themselves. Those quilts are done without a pattern, sort of on the fly, and like a piece of jazz music. In scrap quilting, improvisation takes on new meaning. It means that you may not have enough of a scrap to complete a section of a block where that scrap is repeated. 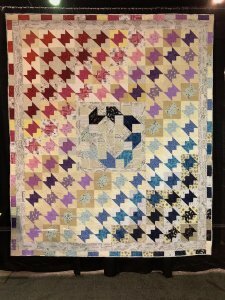 So, you must sub in another piece that is similar enough in color that you don’t notice it immediately, but notice it more when you have spent some time looking at the quilt. Use of “hard to place” fabrics-This was a requirement for this exhibit. 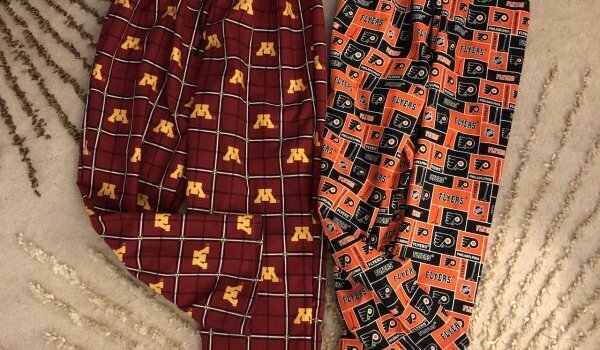 I explicitly spelled out that the contestants were to use fabrics that would be hard to place in a quilt, and they had to do it in such a way as to make them really blend. This is harder to do than you think, but easier to do than you think too. By that I mean that you need to get over the fear factor, and try and place them with like colors. They need to be camouflaged. Then, just watch the quilt observer at the show exclaim with delight when they find it. 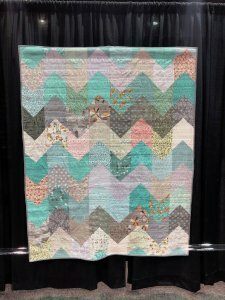 A great scrap quilt draws the viewer in and holds them there for an extended period of time. Use of secondary and tertiary design. By this I mean that when you look at the quilt, it will have a main design pattern. But, stare at it long enough and a different pattern emerges. All of the quilts in the exhibit needed to feature these components in order to be selected. The ones that did the best job of this won a ribbon. The first place winner was Ellen Ault from Tampa Florida. 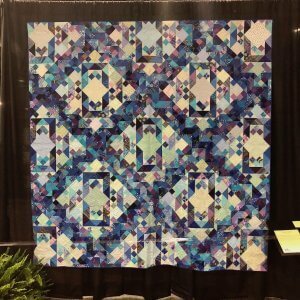 This quilt is an amazing quilt, and it was a show stopper! A photo doesn’t capture how truly wonderful it is. Ellen’s quilt absolutely sparkled. She used the Sunshine and Shadows pattern from the cover quilt of my first book “Quilts for Scrap Lovers”. 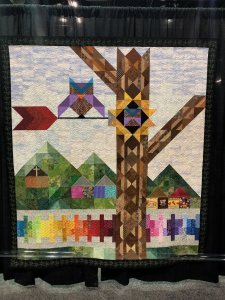 She used the basic building block of the quilt and simply by turning it and alternating the shading, changed the entire look of it. Here you can see a primary design, a secondary design and a tertiary design. There is a large “X” made out of darker scraps. It can also be seen as sashing. You also see the rectangles, but the large blank squares inside the rectangles have an almost keyhole effect. She used many hard to place fabrics in the quilt. She used pieces from a Curious George piece of fabric, and fabric with little cars on it. Looking at it, they just blended in beautifully. Rene Gorbold of Illinois won second place. Here’s her quilt. Rene combined Sunshine and Shadows, Houndstooth, William tell, the Owl from “Owl’s well that Ends Well”, and color brick road. She also created some of her own blocks using the 3 1/2, 4 1/2 and 5 1/2 inch templates. She used the Houndstooth blocks to make up the tree–very unexpected. She had some hard to place pieces in the houses at the base of the mountain. 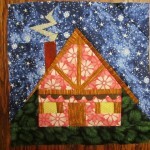 You can see from this quilt that scrap quilts can be pictorial as well as straightforward quilt blocks. Yet, few people think to approach a scrap quilt like this. The third place winner was Cathy Roeder of Ripon. 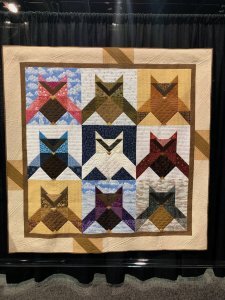 Cathy used the owl blocks from “Owl’s well that Ends Well”, along with Packages Boxes and Bows for the border and Aromatic Rings. 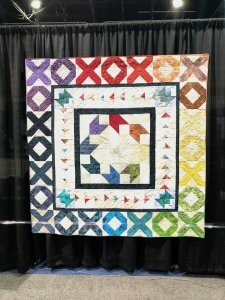 In addition to using hard to place pieces, she created the most amazing border. She divided the bow tie blocks up, and created a porous border so that your eye could move freely through the border. It was not an occlusive border, but an open flow through border. This kept it light. There are secondary designs up in the upper left corner and lower right corner. Can you see it? Many people also remarked that the border looked like birds flying. Another design element. This quilt is made by Ruth Reynoso of North Carolina. It is very beautiful. Most of it is done with batiks. She combined multiple patterns from the first book. She used Hugs and Kisses, Snippets, Modern Anvil and Aerodynamic. I love the color progression. Her quilting was outstanding! This amazing quilt was made by Connie Ghanazzi of Iowa. I absolutely love this quilt. She had so many difficult to place fabrics in this quilt, along with the movement of color. 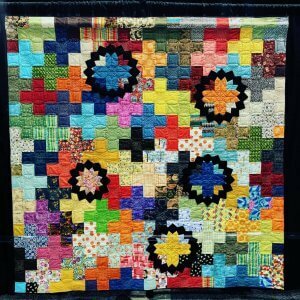 This quilt is the Sunshine and Shadows quilt from the first book. The way in which she moved from a black and gray palate to a turquoise palate is something I have never seen before. She manages to move ever so slowly over toward the blue by using creative shading in the background pieces. Very excellent. This was a sweet little quilt. Created by Carol Preston of North Carolina, it was the favorite of many. It looks very simple on the surface, but she did this remarkable thing of keeping all of her light blocks around the perimeter. Then, when you look closer, those light blocks were some very difficult fabrics to use. It was a relatively small quilt so doing that kind of gradient was not easy. She took tiny strips of fabric and also made a porous border that your eye can move through. This quilt has sentimental value to me. When you’re an author and you write a book you hope that people will like it and will sew the projects in the book. Kathy was the first one to send me a picture of a completed quilt from my book. I love this. She used my Chevron pattern from my first book. I love how it has an almost translucent appearance in some of the chevrons. It’s so delightful. She used some really difficult fabrics. This amazing quilt was made by Jennifer Block of Wrightsville. Not only did she use many hard to place fabrics, but she created a secondary pattern by adding the Aromatic Rings from my second book over the top of Mathematical Genius from my first book. When she did this she created stars from the simple square pattern. Truly excellent. This quilt was made by Jeannie Schultz from Cudahy. She combined Modern Anvil with Aerodynamic, both from the first book. She used a huge variety of low volume fabrics for the background. Within those background fabrics were a ton of hard to place fabrics. She used fabrics with playing cards on them, elephants and more. It was so well done and cohesive, that you didn’t notice the hard to place fabrics until you really looked for them, which was the goal of how to incorporate the hard to place blocks. This was a favorite among many. I also love how the background blocks had a gradient in addition to the blocks in the foreground. This quilt, made by Kathy Decker was absolutely beautiful. Her quilting was amazing. One of my favorite things about the inner border is her use of grays. She used multiple different gray fabrics to allow the eye to rest. She pulled off something that would have been difficult with all those colors. 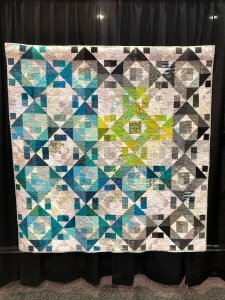 There is a lot of movement in this quilt, and you wonder why it worked so well. I think it’s because of the gray chevrons and the use of negative space in the center. Wise Guys! 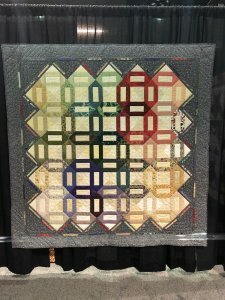 This quilt was named Wise Guys by Carrie Cook. I love it! It was so cute and so endearing. I love the white snowy owl in the center. We have been seeing many snowy owls in Wisconsin. 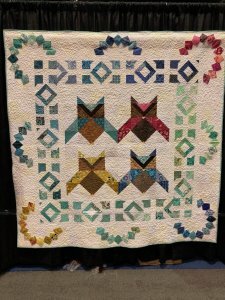 She used some very interesting background pieces, and proves that scrap quilts can be pictorial and not just simple quilt blocks. So there you have it. The official tour. I hope you have enjoyed these remarkable quilts.